The world is mad about mustard! More and more shelf space is being made for the craft mustard revival. We’re learning a lot more about how the rest of the world uses the plant, the seeds, and even the oil, to bring the magic of mustard to more of our home cuisine. Mustards, possibly because of their easy portability and long shelf-life, are a huge part of the daily diet of humans around the world. Frequently, they are a source of national and regional cultural pride. Woven into our childhoods through picnics, sporting events, and our first fond memories of sandwiches, burgers, sausages, or hot dogs, we identify with particular brands/types of mustard used from the time we’re very young as part of our upbringing. When I was a kid, The L.A. Dodgers signature hot dog, Dodger Dogs, were served up with French’s at the boiled dog stands, but the thing was to find the grilled stands and the coveted Gulden’s spicy brown mustard. Indians fans swear by Bertman’s Ball Park. chefs in New Orleans make Zatarain’s Spicy Creole Mustard a staple, It’s still a treat to find your family fave, or that regional pride, outside of your home pantry, or town, sitting on a table or counter of a restaurant. Mustard is a cultural obsession not just culinarily, but also in art, in film and television, literature, herbal medicine, and even in Earth’s orbit. NASA will be launching mustard plants into space aboard the International Space Station (ISS) in 2017. 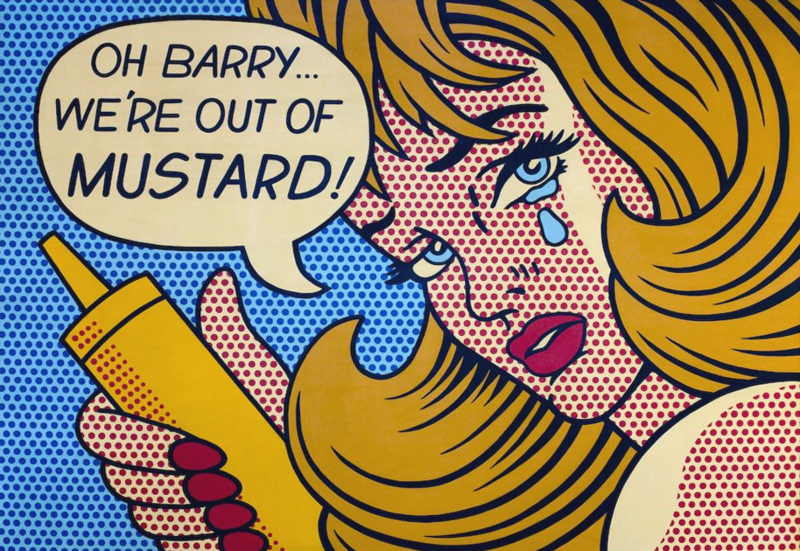 Roy Lichtenstein captures the cult of mustard in his pop parody art. ©Roy Lichtenstein, promoting his site & art. Old regional brands like Cleveland’s Bertman’s Ball Park Mustard, A. Bauer of Queens and Plochman’s in America, Löwensenf in Germany, Colman’s or Tracklements in the UK have their followings, but they are dwarfed by the big corporates that lock up fast food, and thereby lock up store shelves. There is very little truth in advertising in the mustard game. Thanks to Grey Poupon, few of the wine mustards called “Dijon” available for sale are from Dijon, France, which lost control of its name and never got it back. GP is mostly made in Canada and, soon, Michigan. I’m going to re-connect you to your mustard jones. Heck, even if you never liked the big box brands, I am going to give you a great reason to discover the real magic of mustard! Mustard was one of the earliest grown crops. The word “mustard” is a hybrid of two Latin words, “mustum” and “ardens” meaning “burning must.” Ancient mustards were prepared with must, unfermented grape juice. The seed and the plant have traveled well with man’s movement around the globe. 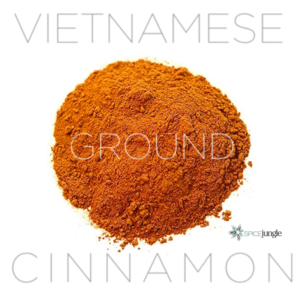 Even though it’s really native to more temperate areas in Europe, popularized by the ancient Greeks and Romans, it has been traded and cultivated commonly for thousands of years all over the world. Table mustard, as a condiment, traces its roots back to Gaul (500 BCE to 100 BCE). Romans imported the custom of using table mustard sometime around their takeover of Gaul in 100 BCE. De Re Coquinaria by Apicius (5th century AD), the earliest known cookbook, has a recipe for prepared mustard. In the reign of Charlemagne (768-814), mustard became commonly planted across France, spread to Germany, and then onward to England. The Renaissance saw mustard proliferate as a part of the explosion of using spices in cooking in Europe, and China and India, which were trading spice outbound, discovering mustard seeds coming in from Europe. In the prepareds, the 19th century was the Golden Age of Mustard. Dijon had added wines and vinegars, and played with the different grinding techniques. 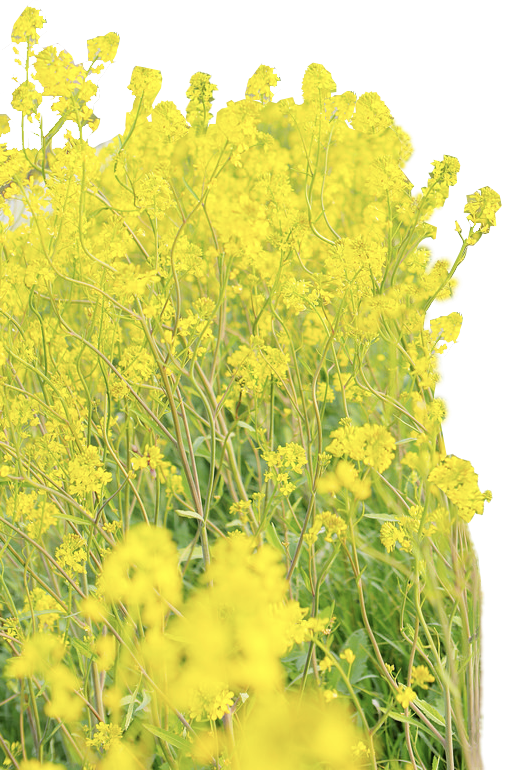 Today, mustard plants can be found across Europe, North America, North Africa, and Asia. Grown in more than twenty-one countries, some table mustards, like Charroux, can trace their origins back nearly a thousand years! Why is the World so Mustard Mad? There is a reason that we crave mustard: Mustard is used in so many dishes all over the world because its chemistry pleases our brains, and the compounds in it are beneficial to our health. Mustard is a cruciferous vegetable from the brassica family, which includes cabbage, Brussels sprouts, and broccoli. 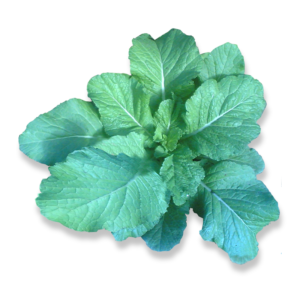 Its leaves can be eaten as a vegetable, but its seeds are the stuff, when ground, of legendary table mustard, dry prepared mustard powders, and mustard oil. Allyl isothiocyanate (AITC) is a colorless oil, an organosulfur compound that gives off a pungent taste found in plants, seeds and roots of mustard, radish, horseradish, and wasabi, and can be found in varying degrees in Brussels sprouts and broccoli. 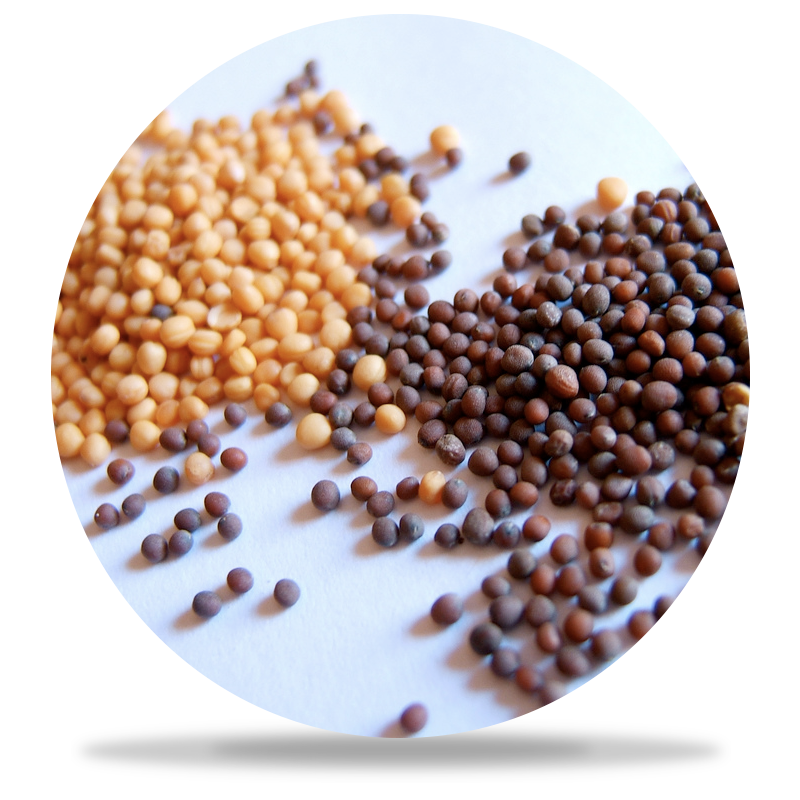 The mustard seed is full of naturally occurring phytochemicals called isothiocyanates (eye-so-thee-oh-sigh-ah-nates) or mustard oils. Each seed is about one-third oil, and the oil flavor variations are what determine the seed’s overall flavoring. Mustard is a pungent flavor, like onions or garlic. It has a strong taste/smell that we find appealing. It is a core of our good health: Mustard oils contain omega-3 fatty acids, proteins, vitamin A, and essential nutrients including varying amounts of calcium, iron, manganese, magnesium, niacin, phosphorus, selenium and zinc. They inhibit mold growth, and bacterial formations of yeast, e.coli, listeria, and many food pathogens. Mustard is also a great antioxidant! Depending upon how they are processed, whole grain mustards are a minor source of dietary fiber. 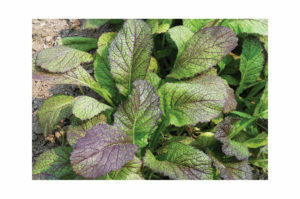 Brown/Asian (brassica juncea) – These are the seeds that have a bit of horseradish-like bite and earthy flavor that are found in wine mustards and in blends for spicy brown/ballpark mustards. Black: (brassica nigra) Small yellow flowers that contain a more bitter glucoside, sinigrin, also found in Brussels sprouts, rabe, and broccoli. They yield hot, rich, round smooth red seeds that turn black. They’re the bitter that goes up your nose if it’s too strong! White (sinapis alba) With flowers which are larger, its pale yellow seed is notably less pungent and more bitter. As a condiment, the fusion of some base vinegar, salt, and mustard seed imparts big flavor and counterpoints the often fatty, heavy foods with which it is served. It also blends with other strong flavors like onions or probiotics used to digest heavy meats like sauerkraut. As an oil, it is used in India, Nepal, and parts of Indonesia and Asia for its fragrant, pungent characteristics that it imparts to fried foods. 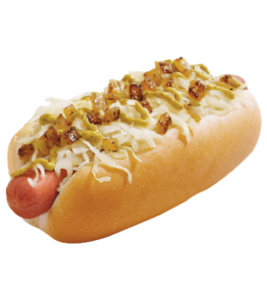 So a New York hot dog with mustard, onions and kraut makes sense. The supporting ingredients transform the tubes of emulsified meats into a more digestible, nutrient-rich meal that has essential vitamins, dietary fiber, and, in the case of the sauerkraut, is actually probiotic. Yet mustard is more than that. 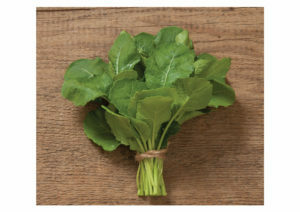 Prepared mustard, mustard oils, and mustard greens are our passion for the pungent in our cuisine, an integral part of our culinary arts and worship of all things food. For nearly two-hundred years, until the Industrial Revolution, mustards, mixed with a couple of other herbs, were used as an aphrodisiac! Just like wines, spirits, olive oils, and other large food industries, mustard is moving out of the shadows of the tourist traps selling quaint condiments as mementos of regional cuisine, and pushing its way into the front lines of supermarket shelves and pop purveyors like Amazon, which tracks over 1900 types of the condiment over more than 1000 brands! There’s a mustard museum, several mustard competitions globally, and, because you knew that there had to be one, a National Mustard Day. There is no such thing as one-mustard-fits-all, and, at home, it is best to have at least two go-to mustards available, and maybe a fun novelty mustard or two, although you can usually make those yourself if you start with a good base mustard and riff on it on your own. Prepared mustard. Dried mustard. Mustard Oil. Mustard seeds. Mustard greens. One plant with so many uses, that we must explore them all, because, at one time or another, they will come into play in your cooking. Why are Mustards Important to Chefs? 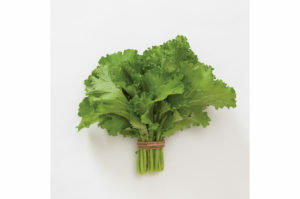 Mustard greens are great fresh or sautéed! Quality and authenticity in your cooking starts with quality and authentic products. Mass produced mustard products are not always evil, although a few of the major brands, laden with additives to make them cheaper and more addictive, need to come off your shopping list. We amp up our game in the kitchen when we learn all of the flavor and texture options that let us riff recipes at home. The mustard plant, in all of its wonderful ways, offers us a lot of opportunity to create. For Mustard, the condiment, I want you to think beyond obvious objects like sandwiches and pretzels, although a great mustard can change your game on both. I put a dab of Creole Mustard into my Triple-C CrazeeCreoleCocktail Sauce. No good mayo is worthwhile without a drop or two of a good wine mustard, and mustards can be used on dozens of dishes from skillet potatoes to chicken and pork dishes to a dill honey mustard with a bit of house-cured gravlax. When it comes to mustard oil, chefs in the USA are discovering its wasabi-like allure, using it in more sparing amounts than Indians traditionally do, dressing up salads and adding a little pop to meats, fish, whatever at some of the nation’s top restaurants. 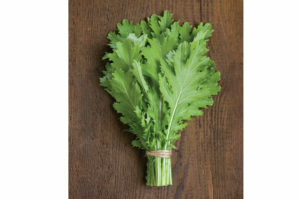 Once considered a foodstuff of African-American soul cuisine in America, mustard greens are being rediscovered by the rest of America, thanks to news of their health benefits, the organic community’s embrace of them, and their feature by some of the nation’s top professional chefs, you can find them as a side, a vegetable in a soup, and as part of more complex dishes like stuffing for empanadas and as a companion to a very up-tempo spanakopita, the Greek spinach pie. They make a super Sichuan stir fry! Mustard is a dynamic flavor that gives your improv plenty of pungent pop! What Mustards Should I Keep in My Pantry/Refrigerator? The bigger the brand, the more malfunctioning the mustard. Mustard seeds have soared up in price in recent years, and the mustard magnates have added more filler and less seed to stave off bottom-line bleed. Just like factory eggs, people buy labels, and slowly adjust their palates to the taste, so no one complains. Yet, after a while, we notice that something is missing. Something we want back. There are something like 2000+ mustards available on the web, and, most likely, hundreds more around the world being sold by small makers here and there. 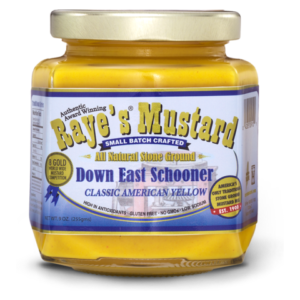 The best yellow in America, hands-down, is Raye’s Down East Schooner Mustard, a craft yellow at a very reasonable price. Anyone who says German food is boring hasn’t tried Löwensenf. In yellow, they make great mustards to suit your spicy strength. Following the Three Bears rule, Extra Hot, Medium, or Mild should be just right. Of the mass market mustards, I prefer Plochman’s when I can find it. Great consistency, and, for industrial-era mustard, one of the few made with a lot of pride day-in, day out. Show a little love to Annie’s Naturals, even if it is owned these days by General Foods, for keeping it real and organic. Any of the organic yellows, house brands for Trader Joe’s, Fresh Market or Whole Foods, which also lack additives, are going to be a win. French’s Classic Mustard has moved to stave off the competition by departing from the “natural”/”classic” model, which saw its mustard use a few additives that folks stopped liking, to just upgrading its classic product, but it’s still the same bulk product that it’s always been. People are accustomed to the brand. It’s just dishwater dull, in my book. The term “Dijon” used to refer to mustards made in Dijon, France, but the name got away from them and now pretty much any wine mustard now seems to get lumped under the “Dijon” label. Many of the cheaper “Dijon” brands sub-out the wine for vinegar or citric acid and toss in a lot of sugar. Zut alors! The overwhelming majority of the Dijon mustard sold in France comes from Canadian, not French, seed, but there are a couple of mustards from Burgundy’s finest traditions that deserve recognition and use, even if they cost a tad more than GP. If you’re used to US Grey Poupon as the Dijon standard, prepare to have your tastebuds explode with much bigger flavor. Legit Dijon is STRONG, and a little goes a long way. Charroux If there is a Rolls Royce of mustards, Charroux may be it. Ground in a century-old mill, they then add a”verjus” of wine, vinegar, spices and salt. Last, St. Pourçain’s white wine (AOC), is added. As you have to send to France to get it, it will be pricey and unfortunately not a regular staple of your pantry, but, at least once, you should get a small bottle and work with it. Join the ranks of the Michelin chefs who use it. It is amazing! Edmond Fallot is amazing mustard, real Dijon with its Burgundy official seal and all. 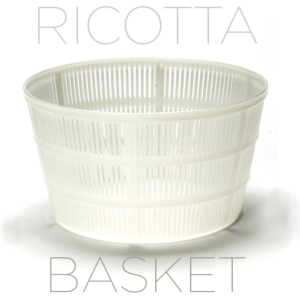 Much more available in the US, its price is comparable to a top quality EVOO or top-of-the-line Parmigiano-Reggiano. If you really want to know what “Dijon” is supposed to taste like, this mustard belongs in your pantry. Maille (Boutique Only) – Just as USA “Import” Japanese beers like Kirin is made by Molson in Canada or Sapporo is made by Budweiser in California, Maille, which began in Marseille, France in 1723 is, today, a unit of Unilever, and their American “Dijon” mustards are made in Canada, and have a decidedly different taste. For real Maille, you want the mustards available from their Boutiques, especially the ones that they draft from taps into a lovely jar for you. 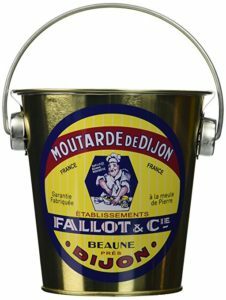 If you can’t visit them at one of their stores in New York City, London, or even, wow, Dijon, they do a nice mail-order that beats supermarket Maille any day of the week. Temeraire, still available in limited quantities, and Laurent DuClos are transforming into Musette, a particularly hard-to-find Dijon, but worth the hunt. Stone ground (see below) is normally the A list in Cognac mustards, but I would be remiss in not taking up for Olivier Napa Valley’s Cognac Mustard, which is so good it should be from France, but since it’s from Napa it’s French-Once-Removed. Vive California! The fad of late in the Dijon class has been the vodkaization of it. Everything has to have an additional flavor. I’ve never been a big fan of flavored anything, when sticking the herb or pepper in on your own when they’re fresh is usually the way to go. Why oh why do you need another jar of the same stuff that limits how you can use it? If you want a maple mustard, have great maple, and great mustard, and DO IT YOURSELF. Wine mustards are show ponies, but Spicy Brown/Deli Mustard are your workhorse mustards. They range from whole grain mustards, with a blend of seeds that are either whole or broken down into paste. Most mustard makers don’t dare fight French’s on the yellow front, but, downtown in the brown, it’s a big free-for-all. It’s also the space where some of those iconic local and regional brands live. So I may be reliving my childhood, but Gulden’s is one of the best spicy browns around. The largest brand in the category has not wavered in its quality, and it’s a great price usually. If I’m going sinfully American and doing the dog or I’m making my own beer brats, this is still one of my go-to mustards. There are a ton of good beer mustards out there, Kosciusko Beer Mustard from Plochman’s is a great balance and wonderful on all things beef. A. Bauer outta da borough of Queens, New York is a horseradish mustard that is amazing not only on its own, but in cocktail sauce, my mayoless New York coleslaw, and many other dishes. You can find it on their website. 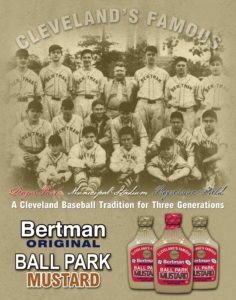 Folks on the North Coast may say it’s the Rock and Roll Hall of Fame, but Cleveland rocks because Bertman Original Ballpark Mustard is legendary spicy brown. Koops is another quality spicy brown mustard that I like quite a bit. Very similar in flavor to Gulden’s, but it often comes up as a better deal, so, in the budget mustards, it gives you great quality at a great price. NOLA essential: Zatarain’s Spicy Creole Mustard. It lets the good times roll in your potato salad, puts the devil into deviled eggs, and has a unique flavor that you don’t find in the other mustards. It was one of the first things Emile Zatarain ever concocted to spice up New Orleans! Stone ground mustards cross a lot of categories, but their wonderfully crunchy texture distinguishes them, for me at least, into their own category. They have their specific uses. They work better in things like potato salad and cole slaws, because they give a little visual pop and a touch of crunch. They’re also great on their own with sausages of any kind, in or out of bun, and, of course, you can’t really do a wonderful charcuterie board without a little and some nice salty cornichon midget pickles. Cognac mustards are a thing, the platinum standard in mustard for specific dishes. Moutarde Royale, by Moutarde de Meaux (Pommery) with Cognac is the most recognized, and for a reason. It’s really good if you pop it in a little cream for a quick sauce that sends beef into OMG smiles at your table. It’s also a stone-cold, stone ground killer on a charcuterie board, or on sandwiches with fine roast beef. 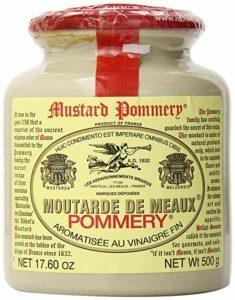 Of the stone-ground wine mustards, the legit Dijon, Moutarde de Meaux (aka “Pommery“) is the best of the best. Monumental flavor, and a perfect coarse grind of the seeds, along with great french wine vinegar and spices. Maille’s stone ground from Canada is a shadow of their pre-corporate days, but their Mustard from the Pump that comes from their boutique stores around the world, or online, is old school perfect. Tracklement’s in the UK is a relative upstart, only in biz since 1970, but they produce three great stone ground mustards, Original Wiltshire, Robust Wholegrain and French Wholegrain all of which are SUPER (Soopah). You can find them at upscale Soopahmarkets in the U.S. like Whole Foods. If you like your stone ground a little soupier, Inglehoffer may be your pick. They blend less seed and more sauce. It’s a mass market, but an acceptable one. Wilkin & Sons Tiptree English Wholegrain Mustard is a name so large they almost need a second bottle, but the jam maker is putting out a pretty credible mustard, albeit a bit pricey for its size. If you’re looking for a nice serving mustard that looks elegant on the table, this will do rather nicely. I will hear from several of you because I’ve left out Tandoori mustard and Tarragon and a bunch of others. There are a lot of prepared mustards out there with all kinds of gimmicks. Maple ones. Jalapeño ones. I would give you this advice: Save the money. If you want maple, take some good maple syrup and a great mustard and mix yourself. Add some fresh jalapeño and some jalapeño powder to the mustard of choice to get that variety, if that rocks your boat. Make up your own! Bourbon, beer or whatever spirit you like, do that. Mustards are a place for the home chef to be fearless, and to riff your own variations. Heck, you get a great one, sell it yourself! One of the best ways to incorporate mustard into your own recipes is to have quality mustard seeds on hand. You can also buy a bigger batch and try your hand at your own homemade mustard! They’re a must have if you’re making my kosher pickles, or for a ton of other pickling recipes. Ground with other seeds and peppers, they’re the Ba-BING in the BBQ sauce, and they can even, in small quantities, put a little zip into your ziti! 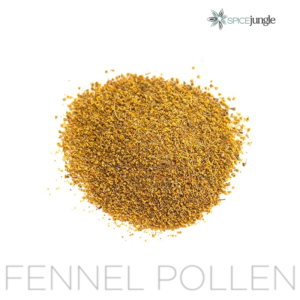 Courtesy: Spicejungle.com: The freshest seeds at great prices! Best way to remember what does what, since mustard seeds don’t have that much smell to follow your nose, is this basic rule: Yellow is mellow. Brown takes it downtown and black is a spicy attack! Mustard Oil: Unfit for Human Consumption, or Amazing Heart-Healthy Helper? Mustard oil is a staple in India, but here, in America, it became sidelined by an old FDA report with a dubious study from years ago about heart health, and by the big mustard manufacturers who don’t want to compete with oil manufacturers, because oil consumes a lot more of the seed and raises seed prices. 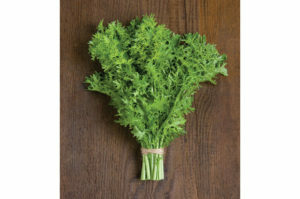 The fact that millions of people consume it every day, and in limited quantities, and more current studies show that it helps strengthen red blood cells and lower bad cholesterol should help sway you, or that pro chefs have been using it for a long time. Americans also consume a ton of the oil by way of their daily doses of yellow on this and that, because the oil is very much a part of the condiment. 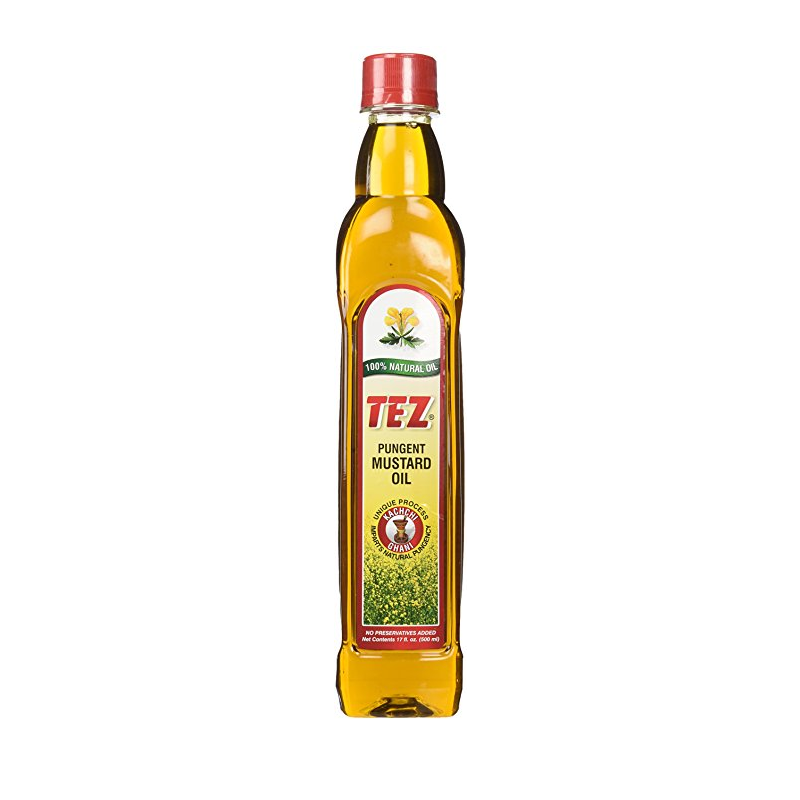 TEZ is mustard oil from black mustard seed, the more pungent and intense flavor that people describe as the heat that burns your nose with spicy mustard. Like sesame oil it is very strong. In certain parts of India they fry with it. 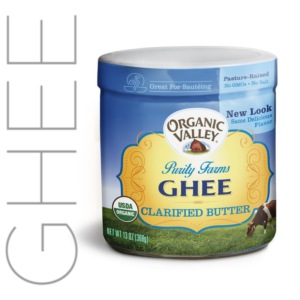 Outside of India I would recommend it highly as you use sesame oil: Sparingly. It provides a lot of flavor to salad dressings, and any recipe that cries out for a little mustard love! When I was in search of mustard greens used to require a trip to neighborhood markets that catered better to the foodstuffs of the folks living in the area, most often African-American neighborhoods, but I could always land some in Asian markets here and there too. While you can’t find them, or collard greens (collards) at every store, most of the “healthier” stores like Whole Foods, Fresh Market, or Sprouts have at least one kind, but there are a whole bunch of varieties of Mustard Greens, and, if you can’t find a supplier, you might have to grow your own if you feel adventurous! Johnny’s Seeds is my go-to for mustard seeds for planting, and all kinds of other seeds as well in at my H2OhGrows hydroponics project. 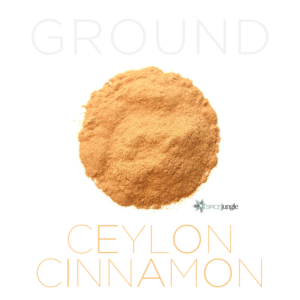 Pretty for salads or as a nice base for a chicken or fish dish needing a bed of both color and pop, Red Giant is your leaf. (Seeds) Much less common at markets, you may be growing your own here. That’s probably more than you ever thought you might find on mustard, but you would be amazed at the passion that it inspires, with dozens of websites, bloggers, and small companies that have put hundreds of hours into telling tales of its history, or blazing new trails in the creation of the 21st century’s definitive condiments in a rebellion to the French’s flag, and Unilever’s demi-Dijon under the grand old name Grey Poupon. Mustard finds its way into some crazy places. Some of the best mac n’ cheese you’ve ever had probably has a splash of mustard in it. Potato salad, great salmon, marinades for steaks and stir fried Chinese green beans and sausage. Even one of my tuna salad recipes is powered up with yellow magic! You have lots of places to explore, and, you’ll find, even if you try a few of these from time to time, that a little mustard lasts a while, so even if it costs a bit more, for the huge flavors that it will add to your food and your recipes, you will look a lot smarter for using any or all of them!